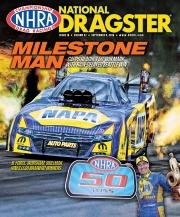 For as little as $69 per year, you can become an NHRA Member and receive fantastic benefits. Start by completing your member profile, then customize your choices and make your payment (Visa MasterCard, American Express,or Discover) on the following screens. (None) Col. Dr. Hon. Miss Mr. Mrs. Ms. Rev. Spc. (None) CFO DDS ESQ II III IV Jr. Sr.
© Copyright 1995-2016 NHRA. All logos and images are reserved.